Since the highly-anticipated Disney Infinity video game launched in August, the most frequent feedback Disney Interactive received has been fans wondering why there weren’t more female characters. Only Violet and Helen of “The Incredibles” and Sally of “Cars” were initially featured, leaving out a rich history of Disney Princesses and other beloved female leads. But that’s now changed with the release of recent female fan favorites Rapunzel (“Tangled”), Vanellope von Schweetz (“Wreck-It Ralph”) and Disney’s newest newcomers sisters Anna and Elsa (“Frozen”). And Wreck-It Ralph’s along for the ride too. A recent call with some of Disney Infinity’s lead creators revealed why it took so long for the game to feature these sought-after characters. Chiming in were Executive Producer John Vignocchi, Vice President and Studio General Manager for Avalanche Software John Blackburn, Vice President of Art for Avalanche Software Jeff Bunker, and Vice President of Technology for Avalanche Software Rob Nelson. Vignocchi noted these new character releases are the biggest wave since the game’s launch, adding unique moves, custom adventures, and more fun for Toy Box mode. They chose these specific characters because of their freshness and current popularity, also having limited use in other video games. Vanellope von Schweetz (a Target exclusive releasing on Nov. 24 for $12.99) is sure to be a favorite of all the new characters, with her unique “glitching” ability turned into a special move in the game. 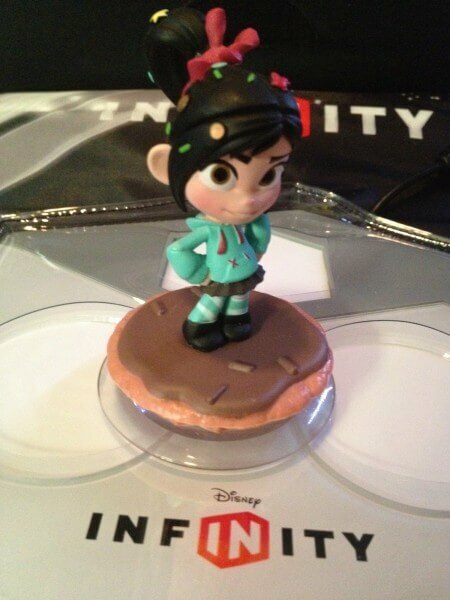 Plus actress Sarah Silverman stepped back into her role to record new lines for Disney Infinity, said to have “had a blast ad-libbing in the studio.” Along with her movie counterpart Wreck-It Ralph (a Best Buy exclusive releasing on Nov. 22 for $12.99), the pair offer the most fulfilling of the new releases as each of their individual adventures play as well thought out mini-games. Vanellope naturally has a Sugar Rush race while Ralph has a side-scrolling adventure, sporting a few retro style graphics and sound effects. Both figures capture the spirit of the characters perfectly, with a bit of an Infinity twist on their looks. 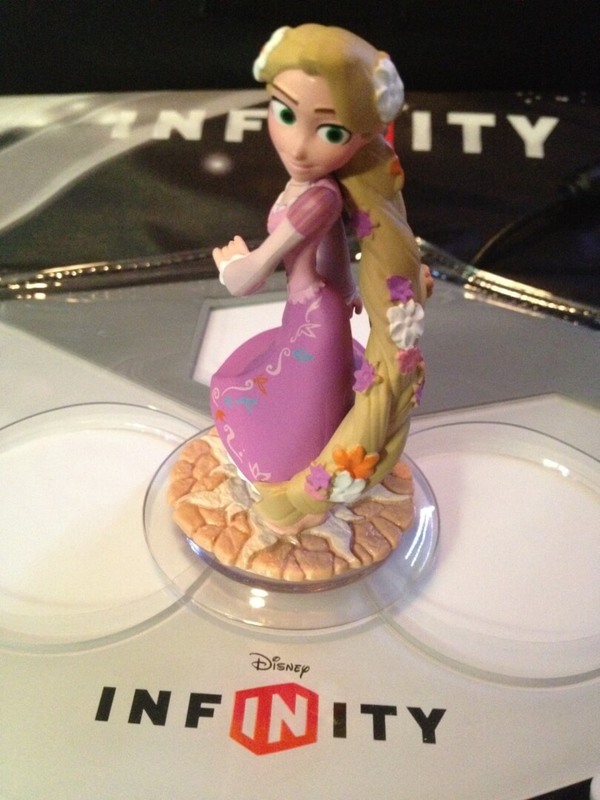 Rapunzel (a Walmart exclusive available Nov. 22 at $12.99) comes across as a free spirit in the game, running barefoot across any terrain. Armed with her signature frying pan, she’s able to deck just about any enemy, though it takes quite a few hits to fully knock them out. Her included adventure is also an enjoyable one, sliding along rails to collect glowing lanterns. Her figure looks less Infinity style and more like her actual movie appearance. Anna and Elsa are sadly a bit disappointing, despite “Frozen” being a fantastic new film. (They’re being released wide in a two-pack with two scenic power discs for $29.99.) Neither of these two character voices entirely sound like they should, clearly voice doubles for Kristen Bell and Idina Menzel. While the power discs do a great job at transforming a Toy Box into a snowy wonderland complete with Elsa’s icy castle in the sky, the rest of the “Frozen” interactions are rather dull. Anna’s grappling hook is a useful, but unusual weapon while her shovel doesn’t entirely suit her character. 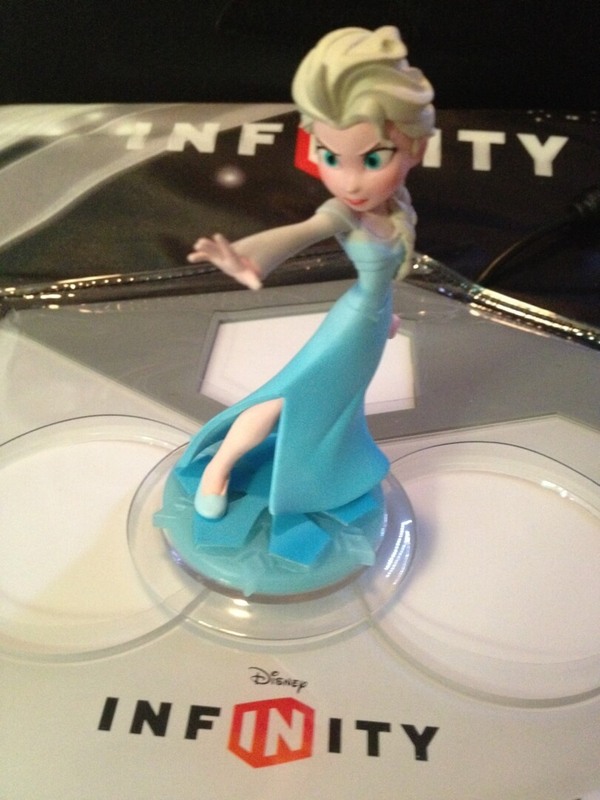 Elsa’s Freeze Ball is also useful to stop opponents in their tracks, with a little bit of flair. But both princesses’ individual adventures are lackluster, clearly showing that the Infinity team had little to work with from the film. Rapunzel has to jump around collecting colored balls in a small icy space while Elsa fires slingshots at the same types of balls as targets. Neither are particularly fun. The figures are an excellent mix of styles, but their gameplay isn’t great. Fans have questioned why there are no new play sets associated with any of the new releases, answered with a variety of reasons. Disney Infinity was launched with the big play sets up front, followed by Toy Story in Space last month. Trickling down the pipeline moving closer to this holiday release window are the add-on characters for Toy Box mode. The team admits “Frozen” was ripe for a play set, they said they the timeline made it impossible for them as they wouldn’t receive the necessary film assets in time for their release. Moreover, they didn’t want to release a “Frozen” based play set so early that it spoils the film, which doesn’t hit theaters until next week. The up-front delivery of the “big” play sets also meant fewer female characters, as the stars of “Monsters University” and “The Lone Ranger” were all males, with few lead females in “Toy Story” and “Cars” either. But the team doesn’t hesitate to note that female-based play sets are not impossible for the future. 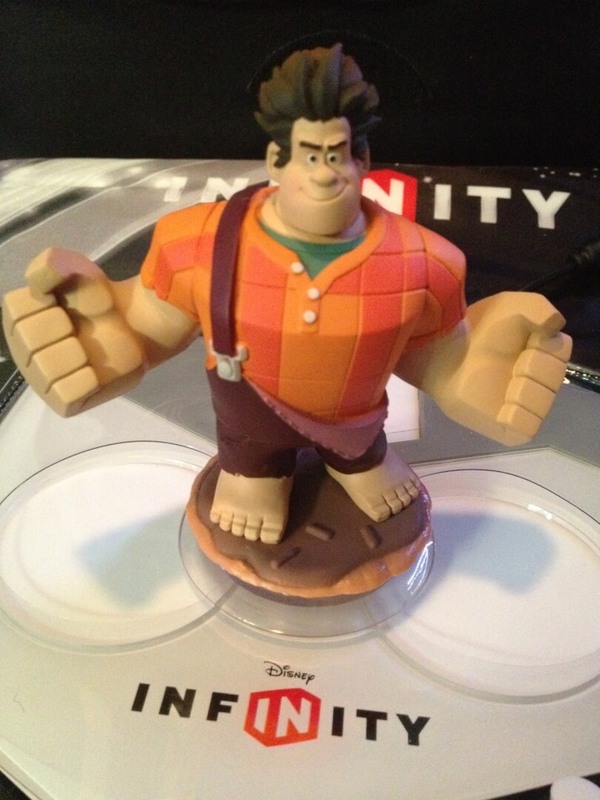 No data was available to share regarding how many males or females are playing Disney Infinity, but it was said that most players ultimately end up exclusively in the Toy Box mode after completing the play sets. With more than 2 million toy boxes downloaded so far and weekly toy box contests being held to find and share new user-generated content, the Disney Infinity team is ensuring the game doesn’t grow stale even if no new play sets are currently scheduled for release. They are working on ways of improving methods for searching for and downloading new toy boxes too. Anecdotal feedback has featured a lot of high praise for Toy Box mode, with players telling the Infinity team that their favorite times playing are online with two or more players, successfully capturing the raw spirit of open-ended play and validating exactly what the game’s goals. The group is still riding high on the success of the game, one of Disney Interactive’s best achievements to date. “Cautious optimism” is how they describe the feeling around their offices as the look ahead to the game’s future, steadily encouraged to “do more” by Disney. 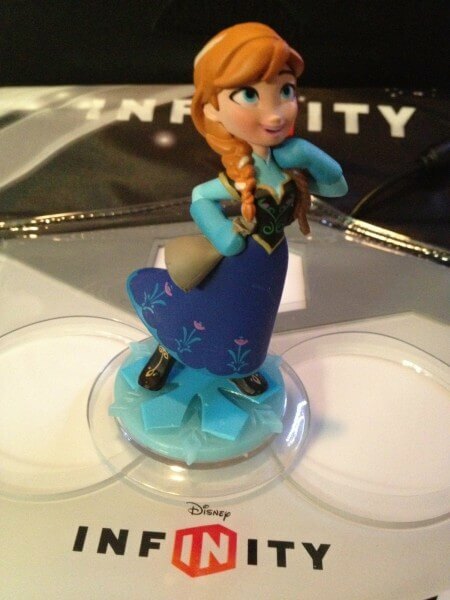 They’re in tune with fans, paying attention to social media outlets to receive feedback how to evolve Disney Infinity. Now that the females are being released, the next most common question the team is getting is whether the characters and worlds of Marvel and “Star Wars” will be featured in Disney Infinity. They called it the “most often unanswered” question, offering only a “wouldn’t it be cool” and “I would love the opportunity to do that.” The winks and smirks could practically be heard through the telephone call. No announcements are made for a sequel to “Disney Infinity” yet, now approaching its first big Christmas buying season. Sorcerer’s Apprentice Mickey Mouse is due out some time in the coming months along with Phineas and Agent P. But beyond that, plans for the game are anyone’s guess. The team left with a final note that there “are still surprises that have not been uncovered yet” offering players a challenge to get creative and explore Disney Infinity more thoroughly than ever. I wonder that Disney Infinity would included Mickey Mouse and his gang someday. I hope they keep focusing on characters and play sets and not on a new game edition. Finally we get some girls! It might be impossible because of the rights, but it would be cool to have a Mary Poppins character. I could think of a lot of powers she could bring with her umbrella or a snap of her fingers. That is the best idea I have heard for Infinity yet! Especially with Saving Mr. Banks coming out soon. I hope they come out with more playsets. I am bored with the ToyBox. I hope they keep focusing on characters and play sets. I want more characters and play sets from classic Disney movies like The Little Mermaid, Cinderella, Hunchback of Notre Dame etc. Why not classic Disney characters? My dream will be also characters and play sets from wonderful live-action Disney movie Darby O’Gill and the Little People. I hope they realize that. I just watched a walk through video of the opening and I have to say I’m very impressed with what they have accomplished. It looks like one more time sink I cannot commit too, but if I had more time I would be so getting this. I think they should have more characters.I love that they have a character that has the same name as me. 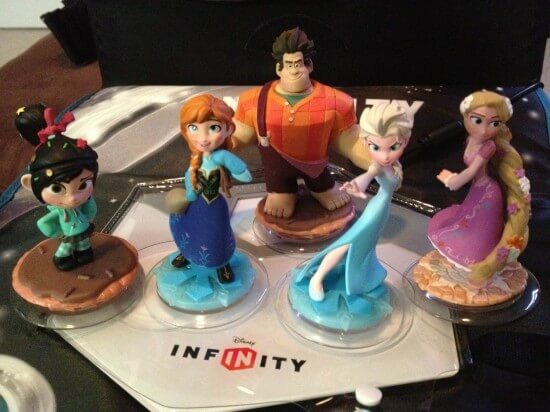 After 12/31/13, will vanellope, ralph, and rapunzel be available other places? We were in Game Stop tonight and they said they would have Vanellope and Ralph in a toybox (but they weren’t for sure on the toybox part) January 7th. Glad to see more girl figures! But having Play sets to enjoy them with would be great toy box gets boring quickly…. Would be better if we could take characters into other play sets. I have a daughter who is desperate for tangled or any of the other original disney princesses to come out as play sets please tell me this is going to happen otherwise this is just going to be yet another boy game for the xbox. Don’t want to play them in toy box they want a game. Honestly, am I the only one who thinks that they should do Marvel and Star Wars characters? I think if they create a play set for Frozen and add a couple new characters like sven, olaf, or Stephan then it would make Anna and Elsa have more opportunites in the game. I really want a play set with them, they are my new favorite characters! Same deal with Rapunzel add more characters! keep the play sets coming. I think that if there were to make more play sets they could include the men from these movies as well like Olaf, Stephan, Eugene because I enjoy playing with my brother and it’s getting pretty boring to just keep playing on toy box. Even having Hans would be awesome. they should have included the Disney fairies like Tinker bell, Vidia, Silvermist, fawn, Irredessa, and Rosetta. that would be soo cool! M88 A number of countries have completely accepted stop. developed a big budgetary industry through playing. the item. That’s where most of the people practical experience M88 Vietnam has fallen. internet m88 casinos. Occasionally they can n’t have the information necessary to enjoy gambling and may enter issues. i hope they will be coming out with sven from frozen the kids would love this character .